Can changing crop pattern foil elephant raids to farmlands? Farmers in eastern Indian states are replacing paddy with alternative crops to prevent elephant attacks. The question is can this experiment be replicated elsewhere? Farmers in eastern Indian states are replacing paddy with alternative crops to prevent elephant attacks. Can this experiment be replicated? For thousands of India’s farmers this is the time to live in fear. If drought has not already damaged their crops, they dread an unpredictable assault: elephant raids. In and around India’s 101 elephant corridors, the animals damage crops spread over 1 million hectares of land. In Konkadasa, a picturesque village in Dalma Wildlife Sanctuary, Jharkhand, elephant raids are common Pointing to her tiny plot of land, Phoolmani Singh says elephants destroy the maize and paddy crops. Phoolmani’s story is no different from other farmers, who are at the mercy of hungry elephants. The Union Ministry of Environment, Forest and Climate Change points out that in the past three years, 1,224 people have died across 15 states due to elephant attacks. In these intense human-elephant conflicts, around 400 people die and 100 elephants are killed in retaliation every year, says R K Srivastava, director, Project Elephant. In a few corridors, farmers are waging a war against elephant raids in a peaceful way. In a bid to protect crops from regular raids, some farmers have given up traditional paddy and vegetable cultivation. Take for instance, Kumud Chandra Pradhan, a farmer from Odisha, who grows lemon. A resident of Bimripal—a buffer village in Satkosia Gorge Sanctuary in Angul district—he is a contented man. “More than two decades ago, I started growing lemon to increase my income. But I did not know it would act as an elephant-repellant crop. It has benefitted me, as over the years I have noticed that elephants hardly enter my fields,” says Pradhan. He has over 1,100 lemon trees on 2.8 hectares (ha) and his annual income is about R25 lakh. In the 1990s, the Odisha government launched a drive to encourage farmers to try alternative crops. “We persuaded farmers to try ginger, turmeric, onions and garlic to minimise losses. We also experimented with chilly fencing on crop fields,” says Lala A K Singh, a former researcher with the wildlife wing of the state forest department. Experimentation such as this is not limited to Odisha alone. 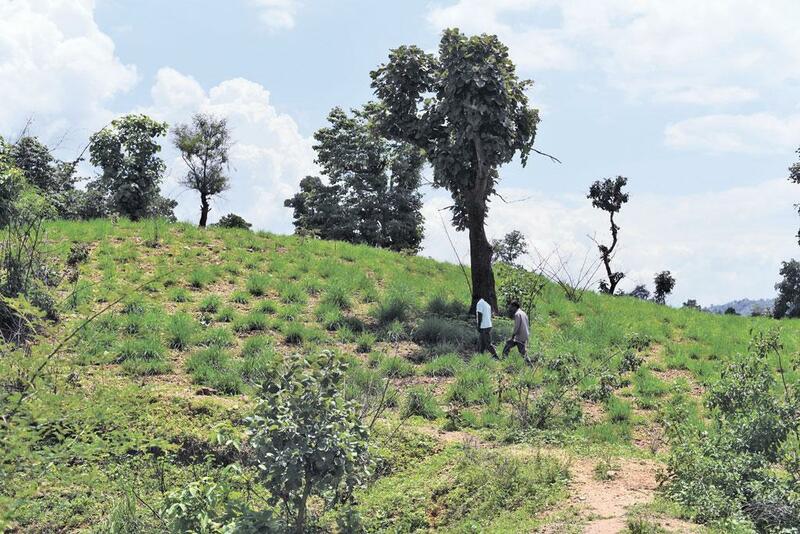 In Jharkhand’s Palamu district, two brothers from Armu village inside the Palamu Tiger Reserve started growing lemongrass in 2013. According to Anil Kumar of the Nature Conservation Society, a non-profit based in Daltonganj, the leaves of lemongrass are hardy, and so, elephants avoid eating the plant. It is also a profitable, low-cost venture. A single plant yields citronella oil for five years, which is used as an insecticide and in soap making. It is a good source of income for farmers, as the oil sells for around R2,500 per litre. However, lemongrass is currently being grown only on two plots in Armu, covering 2.2 ha. Lalji Oraon and his brother Ramesh, who took up lemongrass cultivation, rue the absence of an extraction plant in the area. The Oraons shifted to lemongrass, as elephants used to damage paddy. “Once the extraction plant comes up more farmers will join us. Elephants have not entered my field since I started growing lemongrass. Paddy and vegetables are susceptible to regular elephant attacks,” Lalji adds. In the 2000s, the Wildlife Society of Orissa (WSO), a non-profit, carried out alternative crop experiments in Kanaka and Khajuria villages in Dhenkanal district by promoting a special paddy variety. “We promoted a scented variety of paddy cal led awn among farmers. We noticed that elephants avoided it due to its aroma,” says Biswajit Mohanty, secretary of WSO. However, the project was abandoned two years later, due to fund shortage. As paddy is a staple crop, it is difficult for farmers to give it up. So, the alternative is to plant varieties that mature quickly. For instance, in Bota village inside Dalma, Budheshwar Singh cultivates gora, a coarse variety of paddy that is ready for harvest within 70-80 days. The normal variety takes more than 90 days. “I used to grow chana, kaddu and sem. Now, apart from gora paddy, I also cultivate masoor and mustard, which elephants do not damage. Gora paddy is ready for harvest by September before elephants start their migration back to Bengal around October. “When it comes to crop damage, the conflict increases between September-October and February,” says Ananda Kumar, a scientist at the Bengaluru-based Nature Conservation Foundation. According to Raman Sukumar of the Centre for Ecological Sciences, Indian Institute of Science, Bengaluru, though alternative crops have been suggested since several decades, it has never been implemented on a large-scale. But alternative crops can only play a limited role in providing farmers with a source of income. One must remember that the choice of crops depends on many factors—need for foodgrains by farmers, local conditions and the economics of alternative crops that are governed by market forces. Agriculture experts must demonstrate lower damage rate by elephants and increased income to farmers on a sustained basis when it comes to alternative crops, Sukumar says. Expert Ujjwal Bhattacharya feels if cropping pattern has to change to effectively reduce conflicts with elephants, it must be a community movement, and not just individual efforts. A 6.5 KM trench, built by West Bengal, to control interstate elephant movement has given rise to twin problems: increased human-animal conflicts in Jambad village along the Bengal-Jharkhand border and a drop in elephant count in the Dalma Wildlife Sanctuary, Jharkhand. There are three entry points to Dalma. Most elephants, however, enter the sanctuary from Bengal through a traditional 6-7 km wide corridor situated near Ghatsila. But this year, the trench confused the animals. As a result, Dalma counted lesser number of elephants during the census conducted on May 9-12, as compared to previous years. However, official figures are unavailable. Besides reduced count, Jambad is facing increased raids. Village pradhan Gouranga Gope says after the trench was dug, more elephants are entering the village and destroying houses and crops. Elephant expert D S Shrivastava feels such problems cannot be treated in isolation, as one should keep in mind elephants' behavioural pattern. When elephants face obstruction during migration, they raid villages which come in their way. ªDue to the trench, elephants are using different routes, which has increased conflicts in new areas. I have already written to West Bengal's principal chief conservator of forests (PCCF), wildlife. The trench is causing more conflicts in Jharkhand and it will be harmful for Bengal too. The traditional route should not be blocked,º says L R Singh, PCCF, Jharkhand.